When an Iranian president thunders a murderous threat or an obscure Turkish drunkard has a dream in Mecca or a Jewish couple from Brooklyn lands at Tel Aviv’s Ben Gurion airport, these events might seem disconnected. But they’re not. 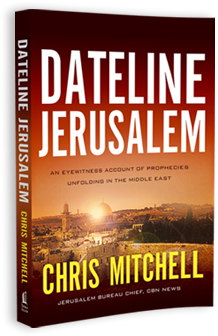 In Dateline Jerusalem, CBN News correspondent Chris Mitchell connects the dots and unveils Jerusalem as the epicenter and crossroads of the spiritual, political, and, yes, supernatural worlds. For thousands of years, Jerusalem’s powerful draw has always transcended simple economics, military strategy, and religious affiliation. In our own time, as the Arab Spring threatens to become an Islamic Winter, one commentator warns: The Arab Spring doesn¹t lead to democracy, it leads to Jerusalem. Indeed, the fragile peace of Israel is in new peril as violent Islamic factions vie for control of surrounding nations. Yet Muslims are converting to Christianity in record numbers.Dateline Jerusalem untangles and chronicles all this through the riveting narrative of a Christian reporter in the upheaval of the modern Fertile Crescent. We live in a world where we cannot afford to be ill informed. What happens in the strategic Middle East, Israel, and Jerusalem is critical. It matters to you. Today¹s news might focus on Washington, New York, London, or Moscow, but history¹s final chapter will be written in Jerusalem. Chris Mitchell¹s firsthand experiences and reporting uniquely qualify him to expound on and explain the major trends and developments sweeping the Middle East and affecting the world. Mitchell has served as the bureau chief for CBN News since August 2000. Chris Mitchell’s firsthand experiences and reporting uniquely qualify him to expound on and explain the major trends and developments sweeping the Middle East and affecting the world. With an eye on the front page of the newspapers and the pages of the Bible, Mitchell provides the biblical perspective readers are so hungry for today. Mitchell has served as the Bureau Chief for CBN News since August 2000, living and working in Jerusalem since that time and has worked for CBN since 1989. He holds an MA in communication from Regent University and a BA from the University of New Hampshire. He is married to his lovely wife Elizabeth and is the proud father of three children: Philip, Kathleen, and Grace. There’s no more informed journalist in Jerusalem than Chris Mitchell! My decades of knowing and observing him mark him as a brilliant analyst, a sensitive observer, and a distinguished, discerning reporter amid the mixed milieu of the Middle East’s conflicts, confusion, and present convergence of political, religious, military, and social disruption. He has the pulse and knows the stakes at risk in these parts, and he brings Dateline Jerusalem to us with a rare professional and prophetic awareness.